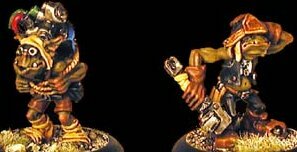 tml> Colonel Marbles Miniatures Masterworks AUGUST 2002! Finally got some more pics of the upcoming Samurai/Gladiator/Cowboy West Wind lines, these from the Old Glory website (who are the States-side distributors for West Wind). Recommend you trot on over there for a look. Picture quality isn't great I'm afraid, and OG are *very* funny about people reproducing their pics, but we'll get on to them and try to get some better pics for you frothfans. 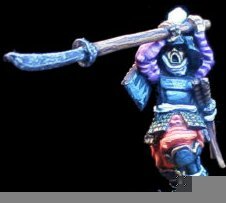 That monk we showed last month is an "Ishi-Ishi" or summat, apparently... looks real good for Samurai/Nippon types anyway - check out the 'Cowboy Wars' figs too! Slightly OT, but who cares!?! No, damned! NO! For the love of God! 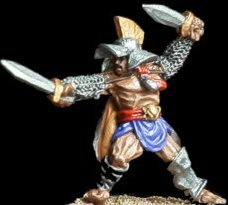 I resisted the temptation of Clan Wars miniatures, closed my eyes for the 100 Kingdoms Samurai and barely escaped the Perry miniatures. I will NOT start a Nipponese army. I will not... oh, why do I even bother? Maybe the urge will go away if I don't look at the pictures on the website. 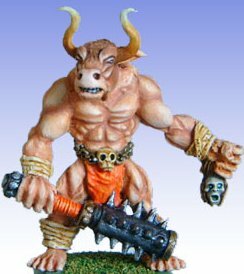 The Clan Wars mini's were well overpriced though, at least in the UK they were. If you managed to resist the Perry figs you've done rather well I think, be a shame to fold now. 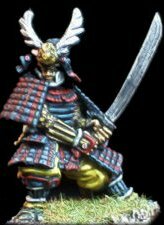 I would be careful about going to the Old Glory website, you're bound to bump into Old Glory's own Samurai range, and those really are cracking value. Oops, have I said too much? 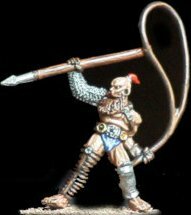 Some of their orcs are passable - remind me of early Citadel 'Fantasy Tribe' orcs. Bugger about their packs though, cos you always seem to get a few repeats, and even more annoyingly its often 3 of 1 fig. What the heck are you talking about dude ???? You're supposed to be looking at the Samurai Wars figs, not the entire range of fantasy figs that Old Glory stock in the US! OG didn't even design the ones you are looking at. Well I realised they didn't make all the figs listed cos they had the 'Super Heroes' figs as well. I couldn't help it if I had to go off and have a froth over the fantasy figs. We're not trying to curtail your frothing old boy, just requesting that you keep the comments vaguely pertinent to the matter in hand. Now, this is the stuff that makes Reaper one of the better manufacturers around. I especially like the vampire girl. And of course the big Norse guy.. The Colonel continues to sweat under his blanket, he is now complaining of a 'virus' causing a 'disk drive-crash', though I've never encountered his current symptoms in all my years as an 'almost-doctor'. 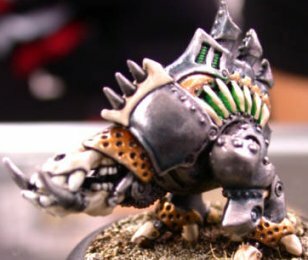 Anyway, in a moment of lucidity he mumbled 'Gobber Bodgers'- which might not make sense to most of you, but to the medically minded clearly indicated an examination of some brand new minis for Warmachine. These are foot support for the big mechas 'Rivet Head Studios' have been producing for the game, a range set to include engineers and all sorts. 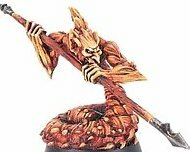 Pretty mad-looking these missile support troops anyway, and bound to please 40K Orkists. 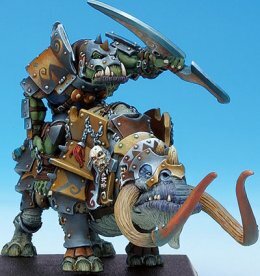 Yeh I'm looking forward to the Warmachine range finally getting released ! These are great too! 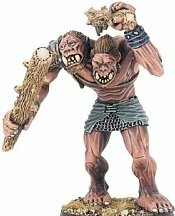 There's a full 360 shot of them at www.warjacks.com. The fellow who looks as if he's carrying a backpack actually has a gauntlet strapped to his back! Wahey, yet more lovely ladies from Shadowforge! 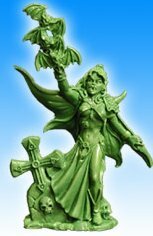 These guys are busy extending their Valkyrie and Dark Temple ranges, including some great new command figs! Fantastic stuff! Good work guys! Great news chums - the Colonel is back !! Thanks to the Doc for stepping in for a few days after my computer imploded. Anyway here are some of the recent Chainmail releases - the Salamander is cool. Yea, they're all pretty cool, I like the two headed troll - very Homerian ('who're you callin Homerian?'). Another great mini from Heresy. OOer, must be chuckin out time! 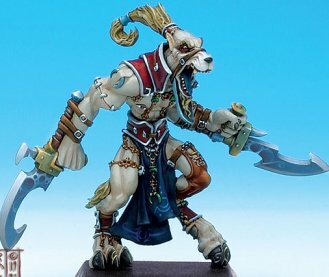 Nice fig as ever from Heresy. Looks a bit too much like Boris though doesn't it? Or is that me? 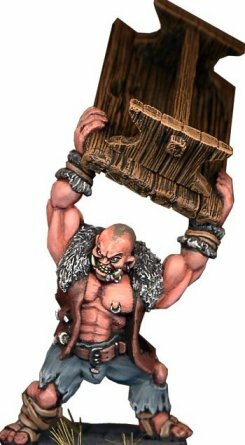 Its not supposed to be table-throwing Boris, its supposed to be a different character (Skoll the Ogre as it 'appens). Nice fig, but gonna look a bit weird in the middle of a battlefield though. No wierder than an Orc gyrocopter I'll warrant. Nono, just completing my Celto-Barbarian gattling gun conversion now as it happens.. 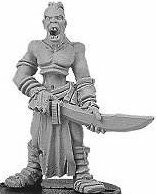 It comes with various heads - a great mini. - DieWerners. The shields back in the melting pot! Some have too big heads - but some of them are very good esp. the town-folk. I recommend to reinforce them with the celtic civilian range. Another great new find from super-spy WK !! 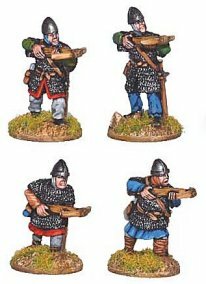 Empire Miniatures are a new historical range concentrating solely on the medieval period. A couple more and you'll have to promote me again. Those are 28mm? Wow, thats pretty cool! 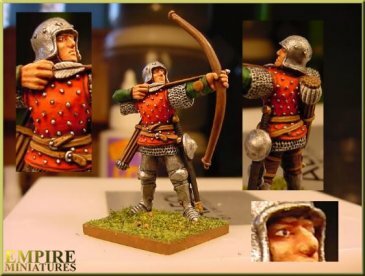 Nice one, seems there's a lot of late medieval figs out there at the moment. Renaissance is the next obvious move, me hopes..? Or halflings of course. The Colonel bags another scoop ! 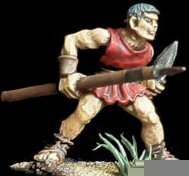 Stone Age Games are producing 2 new miniatures based games. One is called 'Invictus', a fantasy gladiator type thing and 'China Town' a Chop Socky type game. 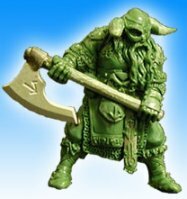 Here are the only mini's currently online. 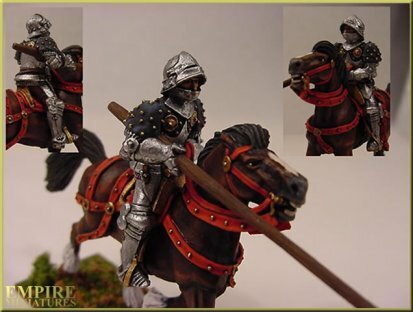 New Wave have some sneak pics of some tasty upcoming Dark Ages figures.. I like the one in the middle. The Cyborg type? 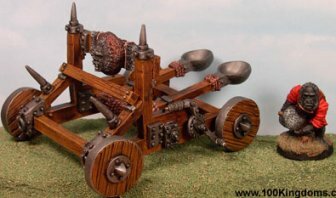 A new 'Simian' mangonel from 100 Kingdoms. I'm not impressed. Not at all. It's sorta samey isn't it? I'd even go so far as to say it's almost bordering on the ridiculous! What a load of nonsense. Fewer guilty feelings about scrapping the crew this way. 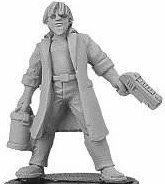 Barmy new figure forthcoming for Warmachine. Ehm.. I think I like it, but.. what exactly are we looking at? 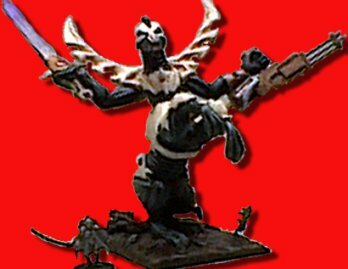 Well its been a heck of a long time coming, but this is a new 'Mezoghoul' figure for 'Warzone'. Its strictly limited edition btw - er, you have just one week to order it from Excelsior !. Good lord. The picture's bloody awful but what you can see looks like a right crock of shite. 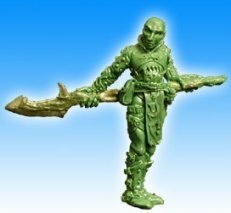 Here at last are the new Celts from Renegade (Steve Saleh sculpter). 8 figs for £7.50 - great value too. They look excellent and superb value as well. That should cheer the Doc up anyway. Why's that fellah got shades on though? Nice big fat swords for the Celtos market :). 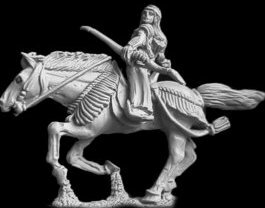 I have some of these, they're really nice clean castings, good detail, for what detail you can give to troops dressed in pyjamas and a ropebelt. Phew, they look a lot better than in the earlier preview shots! Nice value too, might well have to dip into that lot after all(already bulging bag of celts comes apart at the seams, scattering lead everywhere). Are they planning to do any civilians? Gaeseti? Badgers? Good stuff. Very Foundry-like. Now have him do some vikings or arabs. 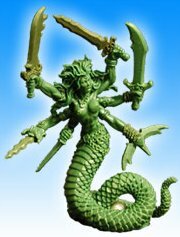 Some new female Shuriken Guard from I-Kore VOID. Nope, not now, not ever !! The last one's a bit lame, but I really like the other two, especially the first one - good dynamic pose. Actually, I reckon they'd look even better without the huge slab-like wings on. Umm, UnclEvl, didn't you say you had some rules for sci-fi usage somewhere in your shed? Any chance of a copy?!? 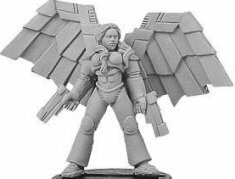 Female Space Marines with wings. 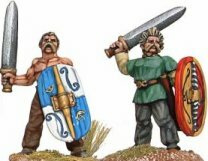 Could these be used as possible alternatives for Sisters of Battle? And would I care? What can I say, the wings are crap. They're probably trying to make the molds last longer with such a chunky design - The Imp. 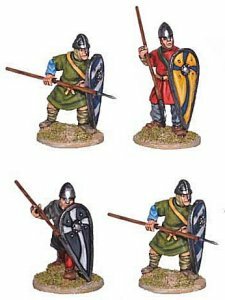 Some of the new Normans from Crusader - another ex-Foundry sculpter's company. .
Not bad, but I prefer his pirate orcs. More character. 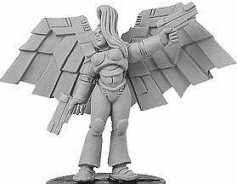 Phigs Miniatures have two new Valkyries out - looking good ! Looking good indeed. There seems to be a market for BB substitutes. 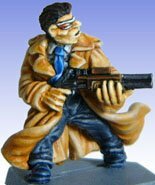 First Shadowforge, now Phigs figs. Not bad. Maybe not quite as good as the others, but would fit in well. 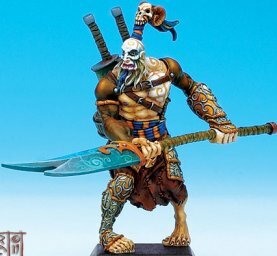 They look like nice additions to any Human and/or High Elf Bloodbowl team. 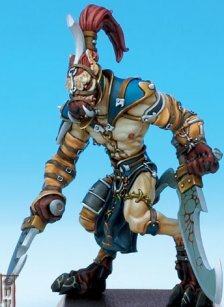 Though, I guess you'd have to be really into Bloodbowl to really get frothed up about it. 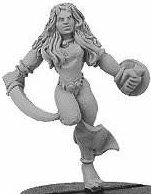 Plenty of new stuff coming from I-Kore , including Sirens and FleshEaters for Celtos & Militia and Supressors for VOID. Yeah, nice figs. 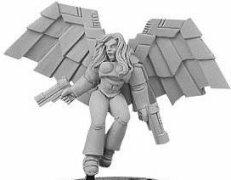 Again, like the wings on the last birds they knocked out, I'd say the back-banner is a bit superfluous to requirements and the figure would be better without. like the first one, but that back banner looks heavy. Could have done with a thinner shaft IMHO. Sci-fi guy offers nothing new, but no complaints either. I'm not going to comment on their excellence, as that would get boring. I'll just say: Keep it up! Rackham always leaves me wanting more. Blast them and their relentless pursuit of quality! ;) - The Imp. Not too bad I guess. Maybe its the paintjobs but they don't really seem up to Westwind's usual standards. The first one looks like he is made of leather, like the feckin' Piltdown man or something ! Have to agree with Doc here. They're not in themselves bad models, but they don't impress me much either. It's been done before.